ARM has acquired its Cambridge, UK, neighbor Geomerics, a graphics software firm whose cross-platform flagship product is Enlighten – described by the company as "the only technology capable of computing real-time global illumination on consoles or mobile platforms," and which game developers incorporate into their rendering engines to add photorealistic lighting effects. "The innovative technologies being developed by Geomerics are already revolutionizing the console gaming experience and are set to rapidly accelerate the transition to photo realistic graphics in mobile," ARM's media processing division general manager Pete Hutton said in a statement announcing the acquisition. "Empowering Geomerics' portfolio with ARM's graphics capabilities and market reach will be transformative for the user experiences in future mobile and entertainment devices," Hutton added. Enlighten technology is used in such games as Battlefield 3 and 4, Need for Speed: The Run and Rivals, and Eve Online, and has been licensed by such developers DICE, Bioware, and Take 2. With the acquisition, ARM is better positioned in its efforts to move highly photorealistic gaming into mobile devices through its partnerships with, well, with just about every maker of system-on-chips for smartphones and tablets, whether they currently use ARM's graphics intellectual property (IP) or not. In addition to its processor IP, ARM also develops also develops and licenses graphics IP through its Mali line. Although ARM's CPU market share in mobile is formidable, its graphics IP is far less dominant – the company says that Mali IP is in "over 50 per cent" of Android tablets, and "over 20 per cent" of Android smartphones. Although ARM doesn't specifically say as much its announcement of the Geomerics deal, the acquisition of Enlighten is almost certainly a move to increase ARM's success in this area. ARM's graphics competition in the SoC arena includes proprietary GPUs such as Qualcomm's Adreno and Broadcom's VideoCore, and third-party IP such as Imagination Technologies' PowerVR Graphics and PowerVR Video lines. Interestingly, Imagination also offers ray-tracing IP called PowerVR Ray Tracing that might be thought to compete to some degree with Geomerics' Enlighten technology. Imagination's general manager for Visualizers and PowerVR Hardware Ray Tracing IP, James McCombe, told The Reg, however, that the two products are complementary, not competitive. 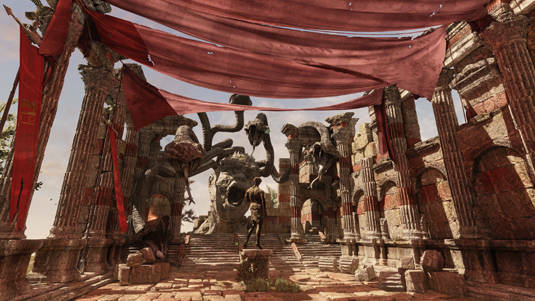 "The Geomerics team has made very impressive use of current generation GPUs to improve games," McCombe wrote in an emailed statement. "PowerVR Ray Tracing is a complementary and fundamental breakthrough in graphics technology that will enable Imagination's graphics IP partners to enjoy ray tracing directly inside their mobile GPU devices with orders of magnitude less power consumption and bandwidth." McCombe also told us that PowerVR Ray Tracing allows artists to streamline their workflows, thus reducing development costs – and presumably time-to-market, as well – a claim that Geomerics also makes for Enlighten. If developers and designers embrace both Enlighten and PowerVR Ray Tracing, and if the claims made by both Geomerics and Imagination are correct, gamers and consumers of other types of mobile entertainment might be the beneficiaries, as well as developers. Geomerics appears to be a beneficiary already. Not only do they get access to ARM's development resources, but as they note on their website, "ARM are committed to Geomerics continuing its business exactly as before. There are no significant changes to how Geomerics conducted business before and all customers can rest assured that they will continue to be supported to the highest possible level of service." In addition to working with ARM on mobile IP, "Geomerics will continue to push for the highest graphical quality across all platforms including both console and mobile," they say.